That drew baby Olivia, her dad and a stuffed rabbit, who was promptly blessed by Aaron Klinefelter, the associate for children and family ministries. The little white dog pictured below seems to be seeking reassurance from its owner, or maybe just striking a solemn pose. Many Christian churches in the United States celebrate the Feast of St Francis of Assisi on October 4 each year, or a Sunday close to that date. The feast commemorates the life of St Francis, who was born in the 12th century and is the Roman Catholic Church’s patron saint of animals and the environment. 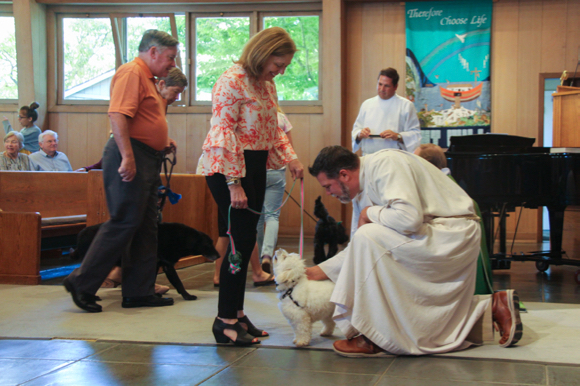 Hence, it’s a popular day for pets to be “blessed”.